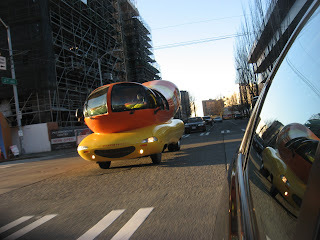 Spotted the Wiener mobile on the streets of Seattle recently. Never mind that this city is rotten with fancy schmancy wheels, this rig has a huge rubbernecking factor. Now, if I were going to drive a car shaped like a food, it wouldn't be a Wiener, and, no, we're not going to bring Freud into this entry. I'd love to roam the streets in a fried chicken wagon or a lemon meringue pie pickup. I wouldn't mind puttering around in a car shaped like a pizza pie. Depending on the toppings of course! What would your edible vehicle be? Back on terra firma, I am dreaming of a new car, that $30K electric sports car that's coming out in a couple of years will just about do it for me. On Friday, I reviewed Ama Ama Oyster Bar and Grill in West Seattle, a restaurant I liked in spite of a few glitches. I was kinda bummed that Jonathan Kauffman beat me to the punch a week earlier in the Seattle Weekly. I'm a big fan of JK, and typically read his reviews. But didn't read his Ama Ama piece until I had written mine. After I sent that review off to my editor, I took a look. I don't think we were that far apart in our assessment, except that he had one of those nightmarish service experiences that can spoil an evening. It absolutely drives home the changeable nature of any restaurant. That's the tricky business of writing about restaurants. I can go and have a fabulous/terrible meal and it can be entirely different for another person the next day. That's why the Seattle P-I pays for its critics to go three times, to gauge consistency. At one restaurant, that was enough to establish me as a regular. After my third time in, a server said: "See you next week?" We are finally settling into our new digs. What an ordeal! Yesterday, I was so discombobulated I locked myself out of the new place on my way to clean the old apartment. (I highly recommend the good folks at Pop A Lock.) Plus, I lost my cell phone charger and we can't quite master the cable/sound system puzzle. Yeah, yeah. Well, it's called "Whining" and dining. So, naturally I had been thinking about what to cook for the first meal in the new house. Something special. I wanted to take my time in my wonderful new kitchen, which has a huge pantry and a built-in wine fridge. Freaking dee-luxe. But it didn't work out that way. After hubby and strapping nephew Nick did all the heavy lifting, they needed some grub, stat. I threw something together: gumbo made from a Zatarin's mix that I kicked up a notch with andouille sausage, shrimp and lots of Frank's Red Hot sauce. Sitting over steaming bowls of the spicy stew, nobody said a word. We were too tired and hungry. It turned out to be a memorable first meal after all. Mercury in tuna, not a good thing. Read Marian Burros disturbing repot in The International Herald Tribune. I reviewed Txori in the Seattle P-I last week, and liked the Belltown tapas spot quite a bit. But I wasn't as impressed with its sister restaurant, which everyone and their brother gushes about. Went to Harvest Vine last month after several unsuccessful attempts to get a table. The reservation policy is "leave your name and we'll call you back IF we can find room" kind of approach. I understand. The place is small. But there certainly seemed to be seats for the regulars. Made me wonder: How can two places run by the same people be so different? Maybe that's what makes the world go round, huh? Walking along the waterfront with my bud who was visiting from San Diego, and noticed a sign for $10 crab at the Bell Street Harbor. Ask for Shorty, the sign said. OK, I'll bite. We wandered down to the dock and knocked on the boat pictured in the background. The bucket with the blue tarp on it. 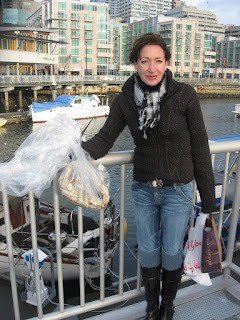 Shorty -- who had long, lovely hair -- appeared and pulled up a pail full of live Dungeness crab. Score! We bought one, and on Shorty's advice cooked it as soon as we got home. Made crab cocktails, which we had with champagne. Toasting our brand new digs that have a view of the Space Needle. Life is good, and that crab was spectacular. BFF Leita was in town for a visit, and we pigged out on oysters at Elliott's. Gorgeous kusshis! We were in half shell heaven. I rarely get out just for s-words and giggles, my reviewing schedule leaves little room on the calendar for meals that are pure pleasure. And this one was certainly that! We split a bottle of L'Ecole semillon -- fantastic with the oysters -- and had mussels for the second course. Oh, and some razor clam fritters. What a treat to sit there and catch up as the weather changed a half a dozen times. 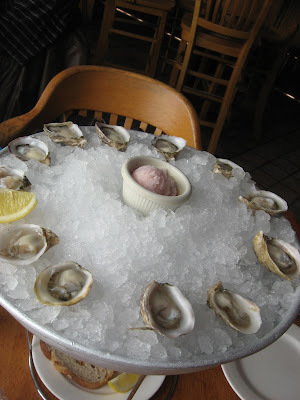 If there's a better place in Seattle to get your oyster on, I want to hear about it! 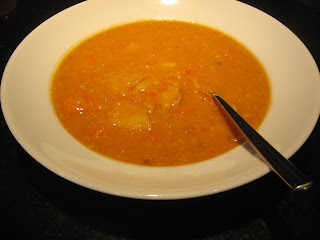 Hours after reading Melissa Clark's chatty column in The New York Times, I made the recipe for the lentil soup she wrote about. The lemon! That's what made this humble legume stew pop. And it took no time to make. Like Clark, I've been noodling around with lentil soup experiments for years, trying to duplicate the golden wonder I used to order at Niko's in Spokane. That was before I had a falling out with the owner, who took exception when I pointed out that he overcooked his lamb. Laith used to make me a special salad, off the menu. Sure miss that! Oh well, that's the life of a food critic. Sometimes you piss people off. Did I ever mention the psycho chef who parked outside my house at midnight? Scary. Went for a bowl at the brand-new Boom Noodles on Capitol Hill... really enjoyed the green tea udon noodles and shiitake mushrooms. That parmesan crisp on top? Freaking brilliant! But what blew my doors off was the mint/cucumber mocktail, a refreshing mate to the deeply flavored dishes at this tasty spot. Tried making that concoction a few times at home, blending basil and a little simple syrup, finishing it with club soda and a squeeze of lime. But it wasn't the same. Looking forward to working my way through the menu at Boom. How about you? Sometimes simple is best. Take the salad verte at Le Pichet: impeccably tender butter leaf lettuce tossed in the absolute perfect amount of vinaigrette. A beautifully balanced dressing. Not too tart, not too olive oily. Toasted hazelnuts on top. That's it. Had that for lunch today, with a side of frites. You know, the diet plate. I'm often underwhelmed by salads, especially this time of year. Though I raved about the cool Caesar in yesterday's review of Cafe Flora in the Seattle P-I. Salad tips? And if y'all cannot comment here because you don't have a gmail account, drop me a line at leslie.dines@gmail.com. Thanks! I'm doing some writing for a new msn.com feature called Daily Access. Check it out and give me some feedback! Love Thai food! Adore it! My sister-in-law is Thai and she was here over the holidays, cooked some incredible meals for us. Thanks Ubon! She and brah-in-law Dave and nephew James are currently living in Cambodia (former residents of Mozambique, Zambia, Atlanta, Albany, Carson City, and, yes, Tacoma... well traveled bunch those Nelsons). They brought me some Cambodian spices, curry and chile powder, black peppercorns that smell unlike any I've come across. Sharp. I'm experimenting, playing around to find the right way to use these unusual seasonings. I'm open to suggestions. This also makes me wonder: Why are so few Cambodian restaurants in a city so obviously enamored of Southeast Asian cuisine? On the Thai food front, I'm so impressed by the elegant fare at May in Wallingford. Baby Girl loved the massaman curry, too. Best she's ever had. Why is this place always empty?? Go for lunch. It's cheap! Claire and I met some cousins for New Year's dim sum at House of Hong, an annual tradition they were nice enough to include us in. Thought the food was pretty good, too. Steamed shrimp dumplings, hum bow, bean curd, Chinese broccoli in black bean sauce, fried rice. Nothing too out there. No duck tongue or chicken feet. The place was packed, which was nice to see, big groups sitting around the round tables with lazy susans that spin. I've been hearing raves about Jade Garden's dim sum, it's on my list. In the same neighborhood, had a great lunch the other day at Tamarind Tree. One of my resolutions is to eat at every cafe, restaurant, pho spot and bakery in the International District this year. Any suggestions?